Our bathroom is usually the most humid room in the house. Hot showers, baths and running taps all contribute to building excessive moisture within the air. This circulating moisture soon condensates on any cold surfaces and leaves the room damp. Without sufficient ventilation, the room cannot fully dry out and leads to a variety of damp related issues. Mould, mildew and rot begin to take a hold of the wood, plaster and flooring. 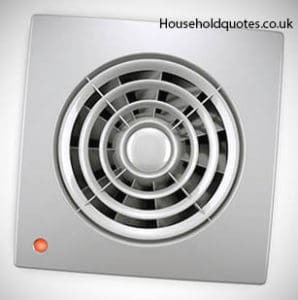 An extractor fan performs a fantastic job at quickly removing excess moisture in the air, along with bad smells. Moisture laden air is extracted and vented outside, balancing out humidity and mitigating damp related problems. Many older homes around the UK are still struggling along without a fan, or currently use a tired and underpowered extractor. Yet it’s an essential appliance for keeping troublesome damp at bay. If you’re interested in learning how to install a bathroom extractor fan you will find everything you need within this guide. Do I Really Need an Extractor Fan? If the bathroom does not have a window you certainly need an extractor fan! If you do then it’s still wise to install an extractor fan to boost the room’s ability to dry out quickly. You should consider replacing your existing extractor fan if it is old, noisy or ineffective. Extractor fan fitting is simple if you are only replacing an existing unit and it can provide great results! Always remember to crack a window or door open after using the bathroom. This enables the fan to draw fresh air and operate far more efficiently. Of these three, the first two are the most common and easiest to install. Now let’s find which set-up is the most suitable for your home. First you need to carefully consider how you might position your fan in relation to the proposed exhaust location. Remember, you’re going need to wire the fan into the exhaust and run ducting through an external wall. So if the loft is directly above your bathroom it makes sense to go with a ceiling mounted extractor fan, run the ducting through the loft and to tap into the existing electrical wiring. Now if your bathroom is on the ground floor or you live within an apartment the solution may not always be so simple. You may even need to lift the flooring to find the electrical wiring to tap into. Which Bathroom Extractor Fan Should I Choose? Air movement rating measured in cubic feet per minute (CFM). The higher the rating the quicker a fan will shift air. More powerful fans can remove moisture faster and as a result it won’t need to run for so long. Larger rooms hold more moisture so they demand a more powerful extractor fan. For an average sized bathroom, 80 CFM is considered the minimum you should be looking at. For an exact calculation, first measure the volume of your room (length x width x height). Multiply this figure by an air change rate (15-20 times per hour is recommended). The result is the cubic metres of air per hour that needs to be displaced. See how this measures up to your fan’s CFM. Smaller fans can be noisier since they have to work harder than larger ones. Quiet running models are available for a little extra cost or you could install it further into the loft to help reduce noise further. The switching mechanism also needs to be considered. You may want your extractor fan to switch on with your lights, run on a separate timer or even a humidistat. Go for a quality fan instead of the cheapest option. Consider the daily use and the years of life you are expecting it to provide. As for extractor fan prices, look to spend around £50. If you only need to replace an extractor fan, swapping old for new, you should be able to use the existing wiring, ducting and exhaust venting. It’s a straightforward DIY job that only requires basic disassembly and securing screws. Make sure you check the existing wiring and ducting is in good shape. If not you will need to repair these before commencing. Also check the dimensions of your new fan line up with the existing holes. Now we have a little more work involved if it’s the first time to fit an extractor. Whilst it’s still suitable for DIY you must obey building regulations for electrical installations. Also consider legal requirements to have work signed off upon completion. If you employ a professional electrician from a website like Quotatis for fitting a bathroom extractor fan you should expect to pay between £250-£450 depending on your location. They will provide you with the required completion certificate but you will still need to decorate over finished plastering yourself. Install your extractor fan close to the primary source of odour or moisture. But it must keep it out of arms reach/spray distance of the bath and shower. Air must be vented outside. Simply exhausting the air into the loft would be detrimental to the roof and electrical circuits present. Use the shortest, straightest ducting route you can to promote airflow. Insulate any ducts travelling along an unheated loft space to combat condensation. Vertical ducts must use a condensation trap to mitigate moisture build up. Once your fan is up you will still need to tend to it periodically and keep it operating efficiently. Consider twice per year as a minimum. Dust will build up around the filters and grills and reduce the fan’s performance over time. Dust covers can be unscrewed or pulled off depending on the design. Then you can use a small paintbrush or toothbrush to clean the fan blades and vent slots. Whilst you are cleaning you should also be inspecting for damage or breaches. Check the fan blades, ducting and exhaust vent. Duct tape repairs will not last long so consider replacing damaged sections entirely. Whilst you’re cleaning you should also inspect the ducting for damage. Duct tape repairs will not last long, consider replacing the whole section if there are leaks. With proper care, your extractor fan will continue to protect your bathroom from damp for years to come. If you need any help with the wiring or suspect something is amiss, seek guidance from local trusted tradesmen.